Imagine all scientific knowledge in the world was lost. The idea that Earth orbits the Sun, the diversity of life arising through evolution and Einstein's E = mc2 all vanish into thin air, with no trace left in any textbook, computer or brain. The Naked Scientists website self-destructs and becomes a homoeopathy forum. In this dystopian nightmare, however, you're left with one glimmer of hope: you’re allowed to pass on one single sentence of scientific information to the next generation. What would you say? What sentence would contain the most scientific information in the fewest words? So forget evolution, plate tectonics or even antibiotics. As far as Feynman was concerned, the idea that everything is made up of atoms would be the most important scientific concept to preserve. Why does that idea, above all others, seem so important? As far back as Ancient Greece, philosophers were concerned with what the world around us was truly made of. The thinking goes, if you can understand the fundamental bits that make up the world around us, you understand what the world truly is and how it comes to be the way it is. Like many cultures at the time, the prevailing thought amongst Greek philosophers was that everything came down to a few “fundamental” elements: earth, water, air and fire. But there were rebels with other ideas. Some philosophers like Leucippus and his pupil Democritus reasoned, 2500 years ahead of their time, that everything was in fact made of little particles they called atoms. Atoms, they postulated, were tiny, indivisible building blocks that came in a variety of different types to compose the materials we encounter every day. There would be “metallic” atoms, “water” atoms and so on for every known substance. 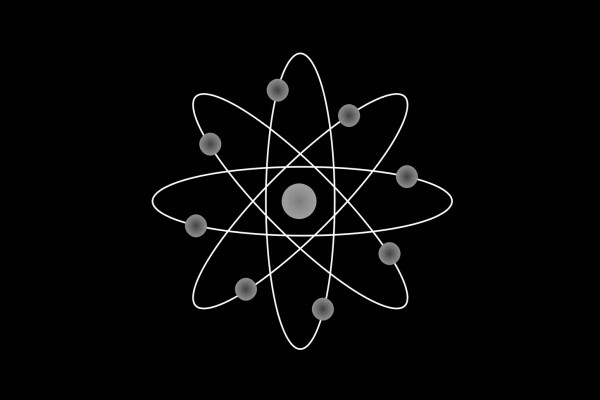 The very name atom derives from Ancient Greek for “impossible to cut”, or in other words, atoms could never be divided into anything smaller. Although the details differ from the picture we have today, it was a remarkably good guess and by the early 20th century, the idea was finally being taken seriously again. John Dalton had observed that the masses of elements in a chemical reaction reacted in specific amounts in ratio to one another (suggesting that they were somehow discrete on some level). Shortly afterwards Robert Brown had realised that if water was made of infinitesimal, jostling particles, it would explain the observed, erratic motion of pollen grains when they were suspended in it. The evidence mounted to support the idea of atoms, broadly as envisioned by the Ancient Greeks, which is why Dalton adopted the name “atom” for his speculative particle. One of these ideas, however, was thrown into sharp relief in 1917. Although all the ordinary matter in the world is made of atoms, the idea of indivisibility was overturned. Exactly 100 years ago in a laboratory in Manchester, Kiwi scientist Ernest Rutherford and his team did what was thought to be definitionally impossible: they split an atom. For Rutherford it was only one of his many contributions to the understanding of nature, being no stranger to upheaving the ideas of established scientists. His own mentor, J.J. Thompson had previously modelled the atom as a blob of positive, electric charge with negatively charged particles called “electrons” embedded in it, like chocolate chips in a lump of cookie dough. This idea was born from Thompson’s own discovery of the nature of electrons which were observed being ejected from heated metals, for which he was awarded a Nobel Prize. Atoms are overall, electrically “neutral” but were known to contain electrons, so Thomspon reasoned there should be a sort of distributed cloud of positive electric charge in the atom to compensate for the electrons’ negativity. In this manner, the positive and negative would cancel out to leave zero net electric charge, since most objects in the world are electrically neutral. In his laboratory in Manchester, Rutherford guided two physicists, Gieger and his student Marsden, to investigate the nature of this positively charged “cookie dough”. 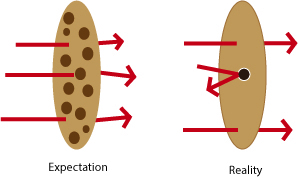 If the positive charge in atoms really was a soft, distributed cloud then it was unlikely to put up much resistance against a hard projectile; cookie dough doesn’t put up much of a fight if you fire a bullet through it. The projectiles on hand came in the form of alpha particles, the minuscule, positively charged particles emitted from radioactive sources like Radium. Under Rutherford’s supervision, Gieger and Marsden bombarded a thin sheet of gold foil with these alpha particles and measured where they went in order to determine what happened when they encountered the atoms of gold, a process known as “scattering”. Initially, checking the position of scattered alpha particles had simply been an exercise Rutherford had suggested to Geiger for his student, Marsden. The principle aim was that measuring the alpha particles’ scattering might help them build a better “Geiger” counter, a device Rutherford and Geiger developed to detect alpha particles more efficiently. Under Thompson’s model, the scattering of alpha particles wouldn’t be particularly dramatic, and the particles would only be deflected a few degrees from their initial course. Rutherford had idly suggested they look for deflections at large angles, events where the direction of the alpha particles changed drastically. This seemingly fruitless task led to one of the most shocking scientific discoveries of the 20th century. In other words, the positive charge wasn’t behaving like cookie dough at all. Instead, there had to be something much smaller inside the atom, concentrated with all the positive charge, squeezed into a ball, that repelled the alpha particles and send them back the way they came (since positive charges repel other positive charges). This tiny clump of positively charged matter at the heart of an atom was dubbed the nucleus. Unlike Thompson’s model, the new model of the atom proposed by Rutherford suggested that it was nearly totally empty, except for a small positive nucleus with some negatively charged electrons orbiting around it. If an atom was the size of a football pitch, the nucleus would be about the size of a garden pea, in the centre spot with electrons whizzing around in the stands. This is generally the same picture we use to visualise atoms today but in 1917, not much was known about the nature of this mysterious nucleus. To probe its secrets, Rutherford’s team bombarded nitrogen atoms in air with more alpha particles, as part of a new series of experiments, conducted to understand the nucleus in atoms. Even amidst the calamity of the Great War, which had halted much of the scientific research at the time, Rutherford found something remarkable. Positively charged particles, even smaller than alpha particles, were being ejected from the nucleus of Nitrogen. By observing that these new particles were travelling much further than alpha particles were capable of, Rutherford proposed that they were, in fact, the same as the nucleus of a Hydrogen atom, the lightest element. Since this new arrival on the scene came in the smallest possible unit of positive charge and appeared to be coming from the nucleus, he suggested that it was a thing unto itself and dubbed it the Proton. In doing so, he established the first known building block of atomic nuclei, like an atom of atoms. Today we know that the number of protons in an atom determines what element it is. For example, Hydrogen has a single proton in its nucleus, Helium two, Lithium three and so on. By removing a proton from the atom, Rutherford and his team had in fact converted Nitrogen to Oxygen, and in a sense, became the first alchemists. Moreover, by chipping a proton off a nitrogen nucleus with an alpha particle, his group was also the first to deliberately split an atom. This would have been enough to cement Rutherford’s reputation as a brilliant scientist for the third time, but his curiosity was insatiable and there was yet another mystery to solve. Although all the charge could now be accounted for by positive protons and negative electrons, even the two combined couldn’t account for the measured mass of the atoms they made up. Something else had to be present to account for all the matter in the nucleus. In 1920, Rutherford announced in a lecture that he believed that as well as protons, the nucleus contained identical cousins of the proton, called neutrons. Neutrons would have the same mass as a proton, but unlike the proton would have no electric charge, which would make them incredibly tricky to find. The hunt began to find this elusive neutron. Along with his colleague Chadwick, they embarked on a decade of increasingly wild experiments to pin down the existence of neutrons. The slippery neutron evaded all signs of detection until 1932, when finally Chadwick performed groundbreaking experiments in just three weeks that undoubtedly determined its existence. With that final addition, the comprehensive picture of the atom fell into place. The nucleus, only discovered 21 years previously, could now be explained by adding up protons and neutrons, clumped together in a tiny ball. 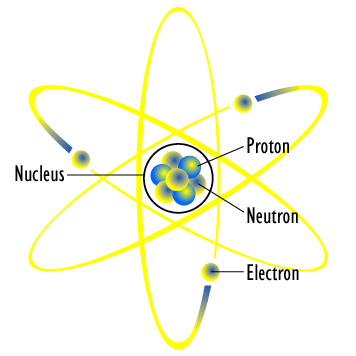 An atom then, was simply a nucleus with an appropriate number of electrons orbiting around it. To have come from the beginning of the 20th century, with scarcely a clue what atoms really were, to understanding all of its fundamental components was a gargantuan task. Rutherford played a pioneering role in this, helping us pin down the atom’s structure and showed that they had a rich, inner world of smaller particles inside them. It is easy now to see why the “atomic fact” was held so dearly by Feynman. From just the three simple building blocks of neutrons, protons and electrons, you could create any of the elements that ordinary objects are made of in the everyday world. This year we celebrate the centenary of one of the most important milestones in Rutherford’s career, the splitting of the atom. In doing so, we commemorate the man and the discovery that ushered us into the nuclear age and set the stage for developing our understanding of the world and everything in it.